Happy first full official day of Spring! I am so ready for it, and even though it doesn't feel like Spring yet, I am using it as an excuse to wear my cute Spring clothes and eat Spring like desserts. 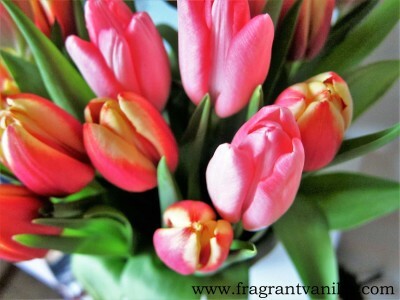 I even got some beautiful Tulips from Eric which was awesome since I won't be seeing any growing for a few weeks. I love when the Spring flowers first start to pop out of the ground, it is like the life has come back here since after winter everything is pretty brown. Here in Minnesota it is not yet strawberry season, but I sure am craving them since to me strawberries remind me of Spring. They are the first berries available here during the growing season. Luckilly I have frozen berries to satisfy that craving. Wyman's was kind enough to send me some coupons to get some of their frozen berries to create a recipe with. I was super happy about that, since I will have to wait for mid June to see fresh local strawberries here. I don't mind using frozen berries in the Winter because they tend to have more flavor than any fresh out of season berries you can buy (plus fresh are outrageously priced, think $12 a container which is what I saw a few weeks back). Anyways, I decided I wanted to make something grand with these berries. 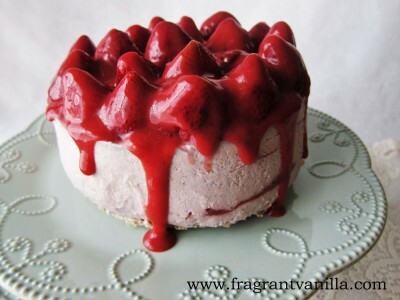 I wanted a big beautiful cheesecake filled with berry flavor and rich in white chocolate and coconut. I hadn't made a raw cheesecake in a while, so this was the perfect time. 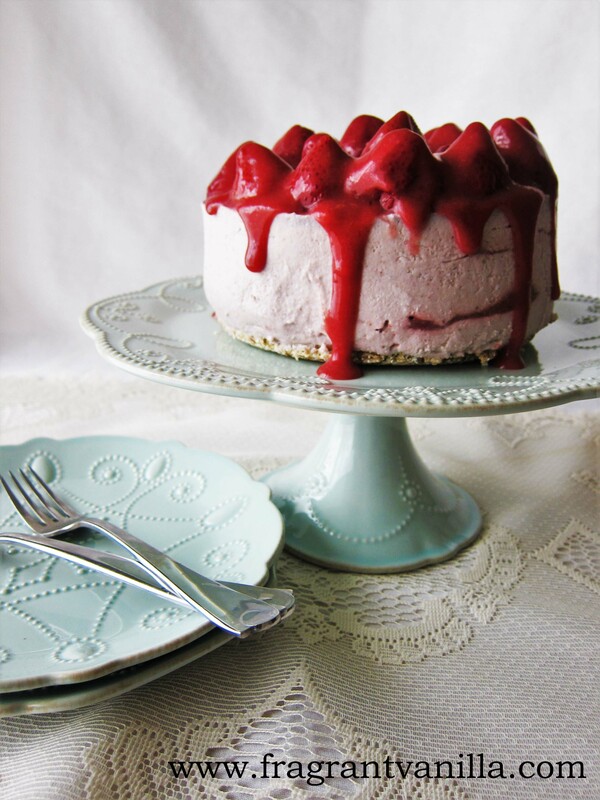 This was actually pretty simple to make, no multiple layers just strawberry white chocolate and berry puree swirled throughout and to top it off. My Mom used to make a cheesecake tart with berries on top in a glaze, and I wanted it to look like that. It turned out wonderful. Sweet, loads of strawberry flavor and delicious. Those frozen berries worked out perfect, and there was no hulling or cleaning required which I was all for. This would be a showstopper dessert for Easter dinner, but of course you don't need any excuse to make it, just go for it. I have included directions for making it with full fat canned coconut milk if young coconut meat is not your jam (and you don't mind it not being raw). It happens to be just a little larger than the raw cake, so please note that if you are making it. I hope you all have a wonderful Spring! To make the filling, in a high speed blender or food processor, combine coconut meat, water, dates, sea salt, vanilla, and berries in a food processor and blend until smooth and creamy. With the processor running, add the coconut butter and cacao butter and process for a minute until blended. Set aside. For the puree, combine all ingredients in a high speed blender and blend until smooth. Set aside. To assemble cheesecake, pour 1/3 of the cheesecake mixture over the crust, then drop some of the puree by the heaping tsp over that and swirl with a knife. Then pour over half the remaining cheesecake, then more of the swirl by the heaping tsp. then swirl with a knife. Pour the remaining cheesecake mixture over that, then more of the puree (you will have extra puree leftover for the topping). Place in the freezer for about 4 hours to firm up. 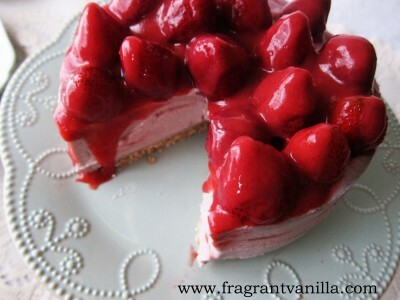 Once the cheesecake has firmed up, Place the whole strawberries on top of it, cut side down, and drizzle with the remaining puree. *If you do not have access to young coconut meat and you do not mind the recipe not being nut free, you can substitute 4 cups raw cashews soaked for 4 hours and drained in the filling. 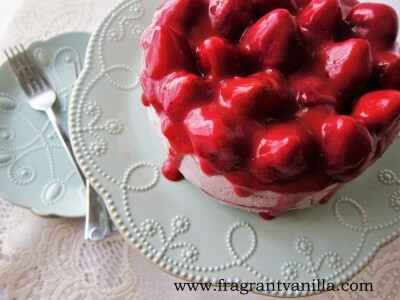 *If you have access to fresh organic strawberries, feel free to use them instead of the frozen. Use the crust recipe for the 6 inch raw cake, the only thing that will be different is the filling. To make the filling, combine all ingredients in a high speed blender or large food processor and blend until smooth. 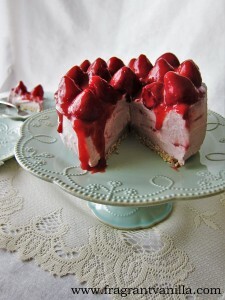 Continue with the rest of the recipe as you would with the raw cake above (the strawberry puree is the same). I love cheesecake. 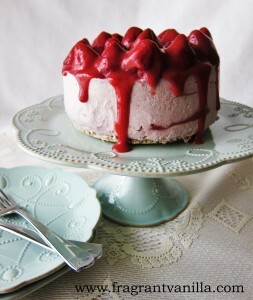 That strawberry cheesecake feels so perfect for spring. Thanks for the recipe. I agree! You are welcome! I'm definitely gonna prepare it for my birthday party! <3 Best combination! It would make the perfect B-day cake :)!